Talk it out. With every classroom I enter or student or colleague I face, I can feel the tears well up and emotions run wild. I’m trying to keep it together, and I’m sure so many of you are as well, but what I’ve found is that it’s more helpful and beneficial to you and your well-being to share…even if it’s just a little bit and even if it’s writing in a journal. 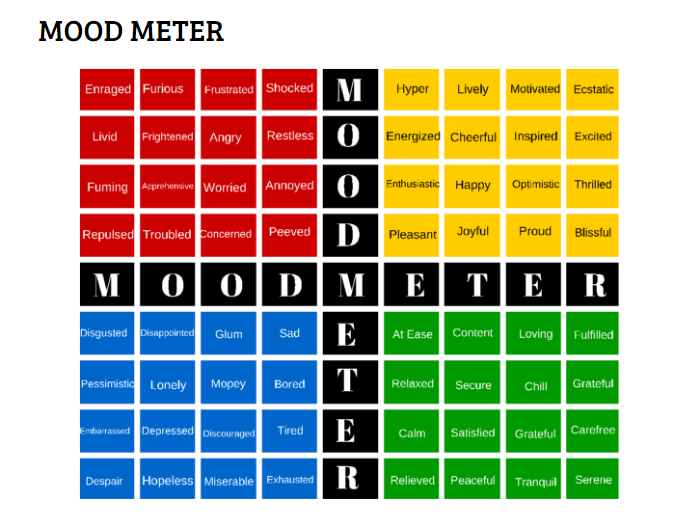 Have you heard of the mood meter? Take a look and recognize where you are on the scale. Ask yourself why you’re feeling this way. Determine how you’re showing those feelings, and whether or not it’s helpful. If yes, figure out how you will maintain them. And if not, come up with a new strategy to help shift those feelings. Unplug. As much as I enjoy social media and socializing, constantly staying tuned in to the post-election frenzy is not only too much to handle, but also affecting you in ways you might not realize. Take a day off from school or work (if you can). Take a break from the hate speech, slander, lies, and negativity, and do something (non-election related) you enjoy. Exercise, watch a funny movie, cook your favorite meal, knit a sweater, learn a new language. Whatever brings you joy, do that, because Lord knows we need more happiness today than ever before. Meditate. This has been quite a divisive election, and the results indicate that there is a majority of people who live their lives through a different lens. Breathe, focus, appreciate our differences, and recognize our similarities. Try using this compassionate guided meditation practice. Grieve. Whether you’re on the winning side or losing side, we have to accept the people’s choice. This is a tough loss for many, and hopefully we won’t take several steps back and lose the progress and momentum we’ve built for the last several years, but do give yourself a reasonable amount of time to properly grieve, seek support and support others. Carry on. There is work to do! Hopefully last night’s election results will inspire, motivate, and energize people to roll up their sleeves and do what needs to be done to affect positive change–change that will benefit everyone regardless of race, ethnicity, religion, age, ability, and socioeconomic status. We’ve come too far to give up now, to grow complacent and hopeless. I come from a people who have experienced the worst of the worst, and still we rise. The days may seem dark and dreary now, but together, if we remain hopeful and steadfast, caring and compassionate, open and accepting, and act with humanity and purpose, we will get through this, we will rise above this, and we will be a greater nation and a stronger people. This I believe.